If you’re looking for a way to keep tabs on your home without drawing too much attention or sticking unsightly little home security cameras all over, we’ve got something you should definitely check out. It’s called the Meco WiFi Bulb Security Camera, and it’s pretty awesome. 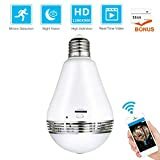 It’s an LED light bulb with an A19 base that screws into any standard socket, but it also has a microSD slot and an ultra wide angle video camera built right in. Use the coupon code MMOK56AZ to pick these up for just $31 each instead of $50 — but please don’t do anything creepy with them. WIDE VIEW ANGLE: Wide 360-Dgree viewing angle, 960P high resolution with no blind area, applicable to various security scenarios, supporting 5 different viewing modes and loop recording in the micro SD card(up to 128GB). MOTION DETECTION: When any motion in the screen is detected, an alert message will be sent to your phone app automatically, which make your place safer. NIGHT VISION FEATURES: Video resolution 1280*960P, night vision range up to 25ft；See in stunning clarity and sharper details with HD wifi cameras in Day/Night which Protect your home’s security day and night. MICRO SD CARD & LIGHT FUNCTION: Live viewing and recording in the Micro SD card(up to 128GB) The camera has a light with it, the Light can be opened automatically, manually, regularly or closed. PLEASE FEEL FREE TO CONTACT US ANYTIME IF YOU MEET ANY PROBLEMS DURING USE.